Zenport EP2-778 Medium ePruner Battery Powered Electric Pruner, 14-hour, 17000 1.25 inch cuts, EZ connect Black 9-PIN connectors, with highly visible orange cord. Zenport SCA2 ePruner, 14-Hour Battery Powered Electric Pruner, 17,000 1.25-Inch vine cuts. The newest and lightest electric pruner technology from Zenport Industries. The Zenport E-Pruner, Battery Powered Electric Pruner, features a powerful 4.4AH 36V lithium battery. At full capacity, this battery will last a full 14 hours and will complete more than 17,000 cuts on 1.25-inch/30mm branches. This pruner is super light weighing in at 1.9-pounds/0.9kg. The razor sharp cutting blade is made of high quality SK5 Japanese steel. Maximum cutting capacity of 1.25-inches/30mm. The high quality durable harness makes for comfortable easy handling while in use. Impact resistant carrying case keeps the tool and accessories safe and secure while storing or travelling to the job. Easy to follow detailed instructions with a portable maintenance tool box to keep this electric pruner operating at optimal performance for many years. Includes all cables and charging equipment which is compatible with both 120V and 240V outlets. Replacement blades, batteries, and parts available. Small ePruner Simple Trigger Battery Powered Electric Pruner, 14-hour, 17000 1.25 inch cuts, EZ connect Black 9-PIN connectors, with highly visible orange cord. 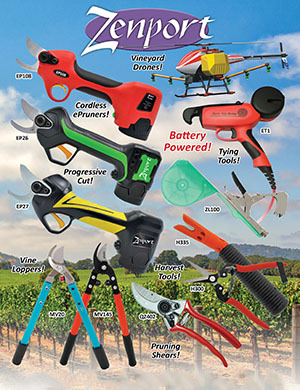 The newest and lightest electric pruner technology from Zenport Industries. Features a powerful 4.4AH 36V lithium battery. Battery will last a full 14 hours and will complete more than 17,000 cuts on 1.25-inch/30mm branches. Super light weighing in at 1.9-pounds/0.9kg. Lithium ion (Li-ion) batteries are an awesome technology constanlty improving and that is why they are very expensive. Please follow these battery care tips to get the longest life and best performance out of them.